"Our basic philosophy is to return to classic gameplay"
Retromade Games has just launched its Kickstarter campaign for helicopter shooter Hell IX, and has confirmed that the game will be headed to the Wii U eShop if its funding target of $22,000 is met. An action title which calls to mind the old-school gameplay of Desert Strike and Tiger Heli, Hell IX is set across varied environments and is being built in Unity. We caught up with Retromade CEO Jose A. Gallardo to chat about the game and developing for the Wii U.
Nintendo Life: Can you tell us a little about your studio, and your background? Jose A. Gallardo: Retromade Games Studio was founded 2 years ago by veterans from the advertising and technology industry. I am Jose A. Gallardo, CEO & Lead Developer and I worked for several years at an advertising company as Lead Multimedia Developer; we had big clients — companies like Publicis. Last year for example, I was developing "advergames" for customers like Heineken, LG, Samsung and Renault. Alex Cervantes is our Lead 2D Artist worked several years in illustration and animation making films and shorts for many studios like Disney and Hanna Barbera. Fabio Ospitio is our CTO and has worked for several years at technology companies. He makes all the magic on the server side connecting players, pushing info between them and so on. David Pereira is our Lead 3D Artist - he is our youngest member but is very good modelling and sculpting - he designs and sculpts for Marvel action figures. Dan Muir is our PR guy, handling our marketing and media relations; he’s an essential part of the team. Not only is he well connected, he’s also incredibly reliable at getting results. Nintendo Life: You mention titles like Desert Strike and Tiger Heli in the Kickstarter - what attracts you to these retro games and how will Hell IX replicate the same feel? Jose A. Gallardo: We love the classic, simple gameplay. With so many games now needing a big tutorial to guide the player, our basic philosophy is to return to classic gameplay. If you remember the old coin-up machines and classic home computers like the ZX Spectrum and Commodore 64 or the NES, Coleco and Atari, the games were very fun, but very easy to learn. After 2 or 3 plays you know all what you need to do in game. Not only games...even classic board games, for example Othello or Chess have very simple rules but infinite gameplay and strategies. Nintendo Life: Can you explain the core gameplay of Hell IX for us? Jose A. Gallardo: Well, I can only say that it’s is very basic in terms of play. Take off, go to rescue a group of Marines on a huge map and take them back to base. However, the game has more in terms of depth; players will have not only this main mission but also secondary objectives will be displayed on HUD, like destroy enemy buildings, eliminate reinforcements and so on. The players must keep a eye on both fuel and ammo and if they need they find themselves running low, they must search for a place to refill. Nintendo Life: You're coding in Unity. What's the experience been like? Jose A. Gallardo: Unity it is a great developing tool, we’ve been working for last 3 years with it. Our previous game Fixie Joe (already released for both iOS & Android and we hope to release too for Wii U after the summer) helped us to learn a lot about of the intricacies but the most important lesson learned was optimization. This allowed us to give great visual quality with a solid level of performance. If we can do this with a simple device like a smartphone, then we are confident of what can we do with the power of Wii U.
Nintendo Life: You're looking to add more missions depending on the level of funding you get from Kickstarter. Do you think this is a risky proposition, as some people may feel like they're only getting half a game if the campaign isn't as successful as you hoped? Jose A. Gallardo: These maps are not missions; they are scenarios and they will be unlocked when player reach a specific rank - for example, Sargent. Every time a player begins a new game he can choose which map to play from that’s unlocked, every one of these maps will have a different difficulty levels. This is a survival game, so players will essentially have a full game that’s self contained on each map. Nintendo Life: How far have you gotten on the Wii U side of things? Have you had a chance to develop anything for the console yet? Jose A. Gallardo: No, Fixie Joe and Hell IX later will be our two first games for Wii U. We just got the Nintendo authorization in July but we’re eager to get started! Nintendo Life: What's the benefit of funding a game through Kickstarter, as opposed to finding a publisher to work with? Jose A. Gallardo: Maybe the main benefit it is the freedom. With a publisher we need to meet their requirements, change the game and implement some of their ideas. This is not bad thing, especially if they’re more a experienced team, but it is an internal war with our game designer and artist. Both sides can very stubborn, which then ends up with delays in development. This is not a matter of money, as even if we do not get reach our Kickstarter goal, we will continue to develop the game but give it a different release date. This is because we need to share our time with freelance work for other companies in order to finance us. However, we wouldn’t turn away a publisher! Nintendo Life: What are your thoughts on the Wii U so far? Do you have any other plans for the console? Jose A. Gallardo: Even with the new consoles arriving later this year to the market, we are out and out Nintendo fans and we have incredible plans for the Wii U. We love the mix of two screens and we want to release a multiplayer game that uses the controller in totally new and unexpected ways. We have two ideas, one related to space conquest and combat and the other related to ancient Asian mythologies, a sort of MMO. But we can’t go further into details on the games without giving too much away! Looks great and it dosnt have a exaggerated goal? Count me in. Looks good to me, I'd be looking to purchase this one if it comes out. It looks like a nice modern makeover for the classics. If done right, and released on Wii U for a nice price, it 'll definitely take away some hours of my life. With such Wii U love and plans, I'll surely keep an eye out for what these people bring us. It sounds like a company that understands gaming. Ahhh Desert Strike and Jungle Strike, the memories! Fixie Joe is pretty poor from what I played of it,uninstalled it after 5 minutes.It's just really frustrating to control but maybe they'll improve it in time.It would definitely benefit from having physical controls though.I was just playing Jungle Strike the other day,love it so hopefully this turns out all right. Looking forward to this. 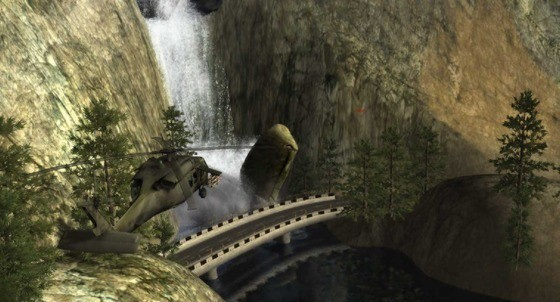 The Strike series was great, and I also liked other helicopter games like Tiger Heli and Choplifter. WiiU's got plenty of platformers that are really great. NSMBU, Rayman Legends, Cloudberry Kingdom. Heck, I'd even take Smurfs 2 over Fixie Joe from the looks of the trailer. Maybe they skip that one for WiiU and focus on Hell - IX because that one looks pretty fun. @bezerker99 don't you mean besides Madden and FIFA? A company that actually knows TigerHeli??? @OorWullie i can't not agree with you, first Fixie Joe's version had several problems with controls, right, but after they release the version 1.3 these problems was solved almost on my iPad2. As the article says: "the most important lesson learned was optimization. This allowed us to give great visual quality with a solid level of performance"
If you have any questions, feel free to ask. I'll answer what I can and get answers from the team the ones I can't. Sounds interesting. Indeed old arcade games were very simple to learn. Wish you the best. Looking forward to seeing your game in the eShop! I would be great with multiplayer and some real time strategy gameplay!!! I'm in!!!! Tiger Heli!!!! Such a great game!! Can't wait for this!!! Classic gaming on Nintendo consoles, oooooh it's starting the make me feel good. Ooooh the Wii U is getting finally a real Nintendo console.